Mum of Five Staying Sane: Our BIG family announcement. There's a new baby on the way!! Our BIG family announcement. There's a new baby on the way!! Ok, so I didn't ever think that I would be sharing baby news from the Staying Sane house ever again, or at least not for a long while yet. However, Thing 1 and his girlfriend are making us grandparents, eeeek! It all came as a bit of a shock. I now know how my parents felt all those years ago when I announced I was expecting at the age of 17. Back then I thought my parents were 'ancient' and I didn't know what all the fuss was about when they grumbled at becoming grandparents at the ages of 39 and 42. Now I completely understand how silly my teenage thinking was and I know they were too young (and I was too young!). Thing 1 arrived the day after my 18th birthday and I had a lot of growing up to do and quickly! I lived with my parents for the first year and they were an amazing help with everything and still are now five babies later! So Thing 1 is going to be a Dad. Is he ready? No. Is he responsible enough? Probably not. Will he make a good Dad? Of course he will. Is any parent at any age really ready for the arrival of a new baby. Mentally, physically, emotionally, financially. Nothing can prepare you for the sleepless nights, the dirty nappies, the endless amount of washing, the crying and that small person completely relying on you for their every need. Honestly Thing 1 is still like that now! However, they will make great parents. They will learn as they go and they will have their families there to help them every step of the way. Everything so far is going well and it's time for their 20 week scan next week. I am super excited even though there is so much they need help with before the baby arrives. I have made myself official pram advisor although I have taught Thing 1 well, even though he won't admit it! 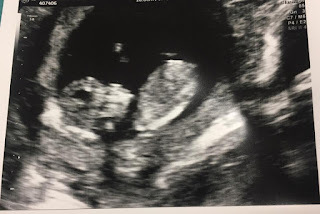 So there we have it, the news I didn't think we would be sharing just yet but it's happening anyway! Now where's my rocking chair and my knitting needles??! !